A common goal for many advertisers is to increase the return on investment (ROI) from their advertising spend. Econometric analysis highlights how moving money into radio from other media leads to greater returns at a total campaign level at no extra cost. 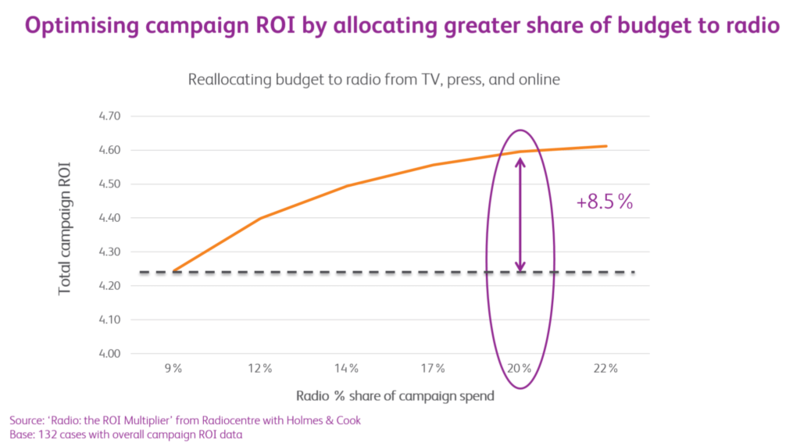 In its analysis of over 500 campaigns, Radio: the ROI Multiplier highlighted how radio delivers an average ROI of £7.70 for every £1 spend, second only to TV, and indicated a relationship between improved total campaign ROI and higher share of budget allocated to radio. However, many other factors can influence outcomes at an overall campaign level, e.g. product sector, frequency of purchase, product life stage, and market ranking. To take all of these variables into account the study used meta-regression analysis of 132 instances of total campaign ROI data to identify the most efficient media budget deployment involving radio. The chart below reveals the effect on total campaign ROI of reallocating budgets pro-rata (i.e. in proportion to their overall level of spend within the data set) from TV, press, and online into radio advertising (outdoor is not included because no significant effect was identified within this particular analysis). The shape of the curve identifies the point where moving money from other media eventually results in diminishing returns. The increase in campaign ROI does not begin to tail off until Radio’s share hits 20%, at which point overall campaign ROI is 8.5% higher. These findings argue strongly in favour of redeploying budgets from other media into radio with the optimum mix likely to vary by campaign depending on the current combination and relative effectiveness of individual media, where known. Based on these industry averages derived from the ROI Multiplier analysis, Radiocentre’s Media Campaign ROI Calculator tool is designed as an initial planning guide to allow advertisers to estimate overall campaign ROI from a multi-media campaign based on two sets of inputs: the nature of the brand and how budgets are allocated across media.